Come and enjoy a lakeside slice of heaven! - refuel and unwind after a fun-filled day exploring some of the world's best mountain biking trails and walking tracks. For families with young children, the property is fully fenced and the house is stocked with essentials (high chair, changing table, baby bath, safety latches for cupboards/drawers). There are kid-friendly books and games, a tricycle and scooter (but BYO helmets) and a child-size kayak and several lifejackets. The big Hannahs Bay playground and a steam engine museum are close by. For couples, we highly recommend getting a massage, spa treatment and/or dining at the Waiora Resort, less than 100m away. For active types, we have kayaks and a variety of outdoor games. The secure garage has space for storing bikes and other sporting gear, and the custom-made bike wash and repair stand makes it easy to clean and tend to MTBs. The kitchen is fully equipped with everything you need to make your own meals, and the gas BBQ is great for grilling up a feed. Alternatively, there's a wide range of dining and takeaway options within 5-10 minutes drive. There's a wood burner and heaters to stay warm in winter, and plenty of fans (ceiling, wall-mounted and standing fans) to keep you cool in summer. Useful amenities include a hairdryer, iron, ironing board, washing machine and drying rack. There's no TV, but there's unlimited WiFi, board games, jigsaw puzzles and books. - We provide pillows, duvets and blankets, but the nightly price does not include linens (bed sheets, pillow cases, bath towels, flannels and bath mat). You can BYO, or rent linens for an additional $15/person. Let us know if you need to rent them. - This is a residential area. No parties, and please be considerate of the neighbours, especially after 10pm as noise carries easily. - Pets allowed with prior approval. - Property may not be suitable for escape artist dogs, big or small (i.e. fence has 10-15 cm gaps between rails and is approx 3 feet high in lower spots). As well as the wood burner, there's a heater in the living area, in both bedrooms and in the bathroom. There's space in the garage for storing your bikes etc, but not enough room to park a car in it. Wood burning stove for heating, located in the lounge, heats the whole house. We provide firewood, kindling, old newspaper and matches. Comfortable sofas (one 2 seater and one 3 seater), beanbag. and window seat. Tea bags, sugar, cooking oil, salt and pepper + some spices, paper towels, plastic cling wrap, baking paper. A good selection of board and card games suitable for a range of ages. Small deck by the front door and outside the main bedroom. Stunning view over the lake. Perfect for our dog to run and swim. Great location with all you need. We absolutely loved staying at this batch. 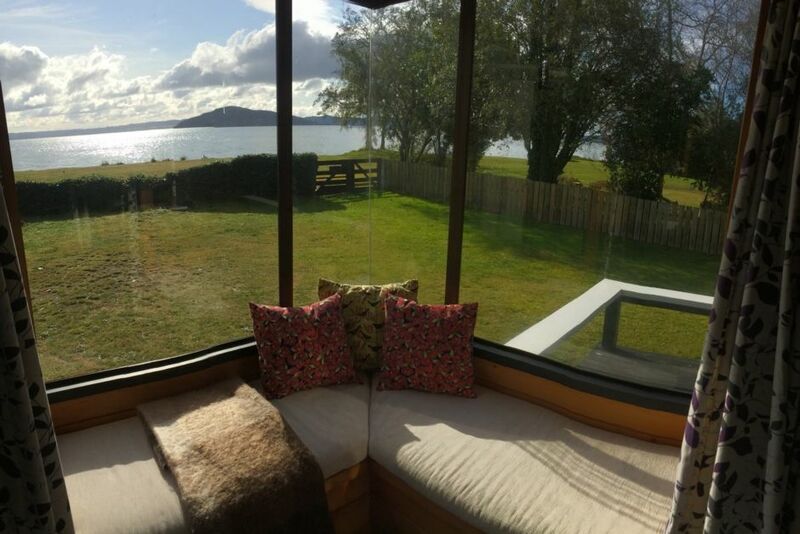 It was so stunning sitting at the bay window looking out to the lake with a hot tea/coffee in the morning & amazing having the lake right there so we could take the dog over for a run around and swim - perfect location with everything you need. Location was perfect to go to Te Puia, Waitomo Caves and Hobbiton ! Great location and hosts were wonderful communicators! Very much enjoyed our stay. We were two couples and felt there was plenty of room. Kitchen stocked fairly well. One more fry pan would have been great. Views were outstanding! The new deck will be nice when complete! One suggestion is to put mirrors in bedrooms, that way when someone is showering you still can blow dry hair and get ready in your room. Lovely and clean! Loved every moment staying in this wonderful lakeside holiday Bach. It has catered for our every need, very well equipped, and perfect in every way. Thoroughly enjoyed our daily walks along the lakefront, nice and quiet, yet close to all amenities. We certainly will not hesitate booking again when next in Rotorua. A wonderful place to stay. We have two young children and a dog and loved staying here. Lots of swimming and a lovely playground nearby. The house was as expected according to the listing. Nice and clean with everything we needed. We will hopefully be coming back to stay!